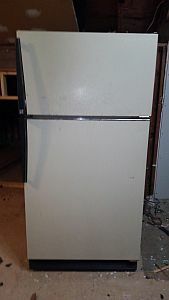 – Amana conventional refrigerator/freezer, 32″ wide, “Amana 18”, older – $20. – Bell & Gossett A/C motor & pump 1/2 hp 725rpm, 1Hz, 115vac, for boiler/furnace, brand new, never used. AmTrol Boiler system expansion tank max 100psi, 240F max temp; NEVER USED – $250. – Fireplace insert by Hatteras – $400, will load.